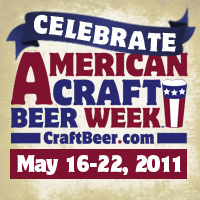 Who's ready for American Craft Beer Week? Another great video put out by CraftBeer.com and the Brewers Association. Get out there and visit your favorite craft brewery and bring a friend who has never been! Best week of the year...besides Christmas week. I designed some labels to put on the beer that we give to friends and strangers! This way, we can hopefully start getting some honest and sometimes anonymous feedback. Friends' feedback is great, but as we all know, sometimes they sugarcoat their reviews. I am of the philosophy that compliments on the beers are good, but criticism is great. If you haven't noticed, there is a link on the sidebar of the blog where you can review the beers that you have imbibed from Lowell Brewing Co. I figured this is a good way to improve on the beers we make! On a another note, the two Busted Wing IPAs were put into kegs on Monday and they should be ready to drink in a week or so. They both were reasonably tasty right out of the fermentor and I'm excited to see how they taste after a little bit of conditioning and carbonation. For now, On Golden Blonde and Bellamy Amber are pouring nicely and my parents are enjoying both of them...success!